A miracle, according to popular belief, was the cause of the foundation of this Order. The tradition relates, that the Knights of the Sword who were introduced into Livonia by Albert III. Bishop of Riga, were, in 1219, so hardly pressed by the heathen Esthonians whom they had subjected, as to induce them to seek assistance at the hands of the King of Denmark, Waldemar II. The latter came, but in the battle which he gave to the combined hordes of Esthonians and Russians, the ranks of his own troops were sadly thinned and dispersed. They had already lost their ensign, and were about to flee, when suddenly a red flag bearing a white cross appeared from the Heavens, the sight of which inspired the Danes with renewed courage. They rallied their ranks, and gallantly vanquished the enemy. The heavenly flag became, to Denmark, what to France was the Oriflamme, whose origin tradition assigns to a similar miracle for Chlodwig. Waldemar II., in commemoration of the event, and at the same time as a reward for his brave warriors, founded the Order of the Danneborg. Thus far tradition. History, however, knows nothing certain about the origin or date of the foundation. The year, 1671, is certainly mentioned as the epoch, but it remains doubtful whether the Order was not renewed rather than founded then, as it may have been lost, or have fallen into decay in consequence of the events of the Reformation. It was Christian V. who most probably revived the Order on the 12th October, 1671, by the advice of his favourite, Count Grifl'enfeld, who, no doubt, hoped, by this political toy, to indemnify the Danish nobility for their loss of the right to elect a King, the result of the preceding revolution. The statutes of the Order - then reduced to a mere court honour - were published on the 1st October, 1693, and remained in force until 1808. In that last year. King Frederick VI. raised it to an Order of Merit, by a patent of the 28th June, and gave it its present organization. All native Danes of merit, whether civil or military, are admissible to the Order, without regard to birth or age, nor is the number of the Knights Hmited. They are divided into four classes, so that no one can enter the higher without having first belonged to the class immediately below it, though the King has the power of making exceptions to the rule. The Knights of the first class go by the name of Grand Commanders ; they are members of the Chapter, bear the title of "Excellency" are next in rank to Field-Marshals and Admirals, and receive the military honours due. to a Lieutenant-General. This degree is considered as a special royal favour. The Knights of the Grand Cross form the second class. Their rank is that of a Major-General. All those who were in possession of the Order, at the time of its reorganization, were placed in the second class. The Knights of the third class, the Commanders, have no real rank, but receive the honours due to an officer of the staff, while those of the fourth class receive the honours due to a subaltern officer. The badge (No. 9) is an oblong golden cross, enamelled white, with red edges, above which is seen the initial of the King under the royal crown, which latter is also found in each of the angles of the cross. 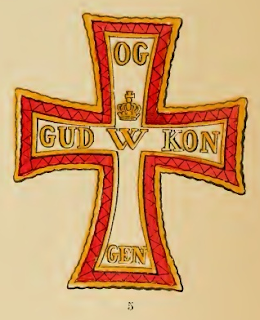 The centre of the front contains a crowned "W" (Waldemar), and upon the four wings of the cross are distributed the words "Gud og Kongen" (God and the King). The reverse contains the supposed years of the foundation, renewal and reorganization of the Order, 1219, 1671, 1808. The ribbon, by which it is suspended, is white with red stripes at the borders. The Grand Commanders wear the cross, without the inscription, but with the addition of diamonds (No. 8) round the neck ; and the star (No. 4.) upon the left breast. 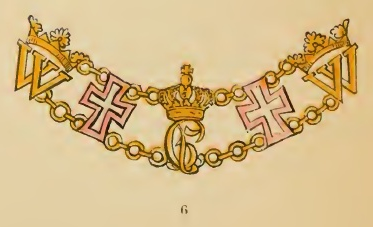 The Knights of the Grand Cross wear it (No 9) suspended by a broader ribbon across the right shoulder, towards the left hip, in addition to the star, peculiar to the class, which is worn upon the left breast. 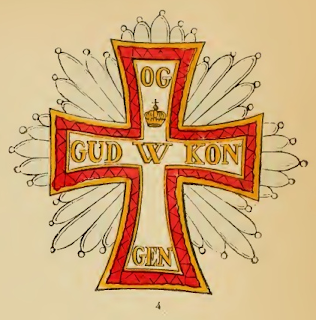 Clergymen, or Knights of the "Order of the Elephant" wear the cross round the neck. The Commanders wear it likewise (No. 9) round the neck, in addition to an embroidered cross (No. 5.) upon the breast, while, finally, the Knights of the fourth class wear the cross round the neck, without the addition of a star. The Order celebrates a festival at the Castle of Rosenburg every year, on the 15th of April, the birthday of Christian V. Then, as on all other solemn occasions, the Knights of the two first classes wear a mantle of pale-red velvet, trimmed with white fur, white breeches, white stockings, and white shoes ; also a black hat with white and red feathers, while the decoration of the Order is suspended by a chain, the links of which consist alternately of the crowned initials of Christian V. (C. 5.) of Waldemar (W.) and of the cross (No. 6.). The motto of the Order is : "Pietate et Justitia" (By piety and justice). Various definitions and derivations are given of the word Danneborg; the most probable deduces it from the old Danish "Brog", signifying "cloth, texture, flag". Danneborg may, therefore, mean, the flag of the Danes - the standard of Denmark. As a fifth class of the Danneborg Order may be considered the "Men of Danneborg". By two royal patents (28th June, 1808, and 28th January, 1809) the silver cross of the Danneborg Order was likewise conferred upon all Danish citizens who had distinguished themselves in their respective spheres by honest conduct and actions benefitting their fellow-creatures. This decoration is also a sort of stepping-stone to knighthood. The military are bound to shoulder their arms before the wearer, who have also free admittance to the meetings of the Danneborg Knights. There exists also a fund in aid of the necessitous members. The above silver cross (No. 10) is also worn by the King, Members of the Chapter, and Knights of the Order of the Elephant, while its presentation to Knights of the Order of Danneborg is considered a new proof of royal favour.